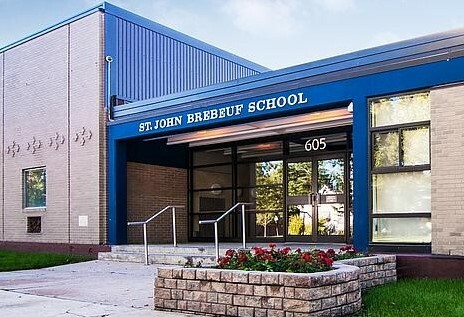 St. John Brebeuf is a parish school which exists to provide quality education to Catholic youth. We also welcome students of other faiths who are open to our educational mission. We recognize the partnership that needs to exist between home, school and parish if students are to benefit fully from their Catholic education. We believe and encourage open communication between parents and teachers so that we may form a partnership that assists each student to realize their personal potential: academically, socially, emotionally, spiritually and physically. We believe that it is in community that we reach our full potential, and therefore, in the spirit of the gospel we are encouraged to share our gifts with others. We, the staff, are dedicated to empowering students to develop the strategies and skills necessary to become happy, productive, lifelong learners. This year we continue to focus on Moral Education with a number of initiatives that enable us to live, love and serve in Christ. The House System continues as a means to foster school spirit. Students and staff are initiated into one of the four Houses (Domus Spei, Domus Caritatis, Domus Fidei, or Domus Veritatis), gathering thorughout the year to participate in community building activities. Roots of Empathy is an evidence-based program that has shown a dramatic effect in reducing levels of aggression among school children while raising social and emotional competence and increasing empathy. Each year, the program is implemented at the grade 4 level, allowing students to follow the development of a community infant through regular school visits and specialized lesson plans.